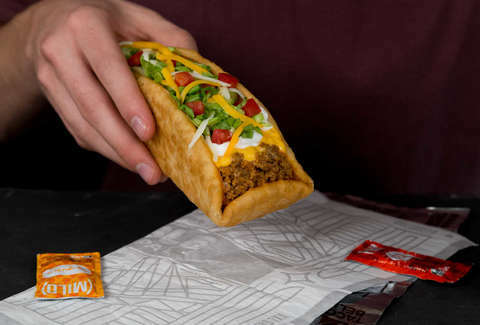 Taco Bell routinely tests the limits of how much ground beef it can stuff into its insane, Mexican-inspired stunt foods. The late-night favorite chain did exactly that with the beastly Triple Double Crunchwrap and again with the humongous Double Chalupa. Now, the second of the two meat monstrosities is officially back on the menu at T-Bells nationwide. In case you've never subjected your stomach to the Double Chalupa, it's exactly what its name suggests: a hefty taco that's packed with double the ingredients -- beef, lettuce, tomatoes, cheese, sour cream, and nacho cheese sauce -- of a normal Chalupa and probably double the reasons to question your life choices. In fact, Taco Bell claims the Double Chalupa is loaded with so much beef that each weigh 9 ounces, or more than half a pound. The chain even made an oversized taco shell to hold all the ingredients, which makes it resemble a boat. You can order them individually or you can get a $5 Double Chalupa Box, the latter of which comes with a Double Chalupa, a Crunchy Taco, Cinnamon Twists, and a medium drink. The combo box also comes with a chance to win an Xbox One X Platinum Limited Edition Bundle. Notably, the special consoles will feature Taco Bell’s famous “ring” instead of Xbox's signature power-on sound, according to a press release. If you haven't put two and two together yet, think taco box and Xbox. Get it? All said, Chalupa fans have a lot (of beef) to be excited about. But we must say it's a shame they didn't double the size of Fire Sauce packets, too. Tony Merevick is Senior News Editor at Thrillist loves the Fire Sauce. Send news tips to news@thrillist.com and follow him on Twitter @tonymerevick.